Personnel at the Port Isabel Detention Center receive Homeland Security buses in preparation for an evacuation Tuesday as Hurricane Dolly approached the Valley. In a lawsuit filed against the U.S. Department of Homeland Security in federal court last week, a Brownsville man claims his employee security clearance was rescinded because of where he was born. 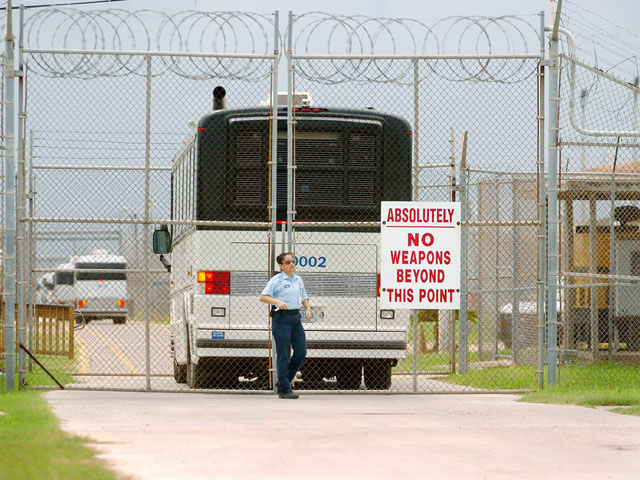 Jorge Cruz Fano claims he was discriminated against and his civil rights were violated when DHS officials rescinded his security clearance at the Port Isabel Detention Center without a legitimate reason, the lawsuit states. Born in Veracruz, Mexico, Cruz’s U.S. residency is legal. He has a civil engineering degree from the Monterrey Institute of Technology and Higher Education, also known as Technologico de Estudios Superiories de Monterrey, the lawsuit states. At the time DHS rescinded Cruz’s security clearance, he had been an employee with KCORP — which is based in Fairbanks, Alaska, and provides facility maintenance services for the detention center, as well as other DHS facilities — for more than three years. Cruz filed a lawsuit Feb. 12 against DHS, former acting DHS deputy secretary Elaine C. Duke, current DHS secretary Kirstjen Nielsen, and acting director of Immigration and Customs Enforcement Thomas Homan, in their respective official capacities, claiming he was discriminated against because of his race. The 44-year-old man claims two DHS/ICE employees — Janie Bennett, the assistant field office director of enforcement and removal operations for ICE; and Paul Salinas, the facility manager for ICE at the detention center — harassed and threatened Cruz prior to the rescission of his security clearance, court records show. Cruz’s attorney, Anthony P. Troiani of Brownsville, declined to comment as litigation is pending. A request for comment regarding the allegations from DHS’s public affairs office went unreturned as of press time. In addition, it’s claimed that Salinas’ behavior was not limited to “barking” orders at Cruz inside offices, but those instances also took place in the halls of the detention center. The lawsuit also alleges “Salinas repeatedly demanded Cruz break protocol, ordering him to buy equipment and do work that was outside the scope of KCORP’s contract,” the suit states. KCORP terminated Cruz after DHS pulled his clearance. He was later rehired, but now must travel to assignments in Del Rio, Laredo and El Paso and facilities in New Mexico, according to the suit. Because of the reassignment Cruz has been “forced to incur the additional cost of maintaining an apartment in Del Rio and his home in the Rio Grande Valley, in order to keep his employment,” the court record states. Cruz is asking for a jury trial and requesting DHS reinstate his security clearance, award compensatory damages, including front and back pay, the suit states. He is expected in a Brownsville federal courtroom on May 8 for a pre-trial conference, court notes show.